Start in Phnom Penh and end in Siem Reap! With the in-depth cultural tour Six Days in Cambodia, you have a 6 day tour package taking you from Phnom Penh to Siem Reap and through Phnom Penh, Cambodia and 3 other destinations in Cambodia. Six Days in Cambodia is a small group tour that includes accommodation in a hotel as well as an expert guide, meals, transport and more. Tour guide was funny and awsome! Friendly and helpful. I recommend Cambodia tour with Gecko. Geckos operates tours for travellers between ages 18-39. They are geared towards active, budget-minded young travellers who want to meet lots of people (often accommodation is shared 4-6 people in dorm style rooms) and tend to be very popular with university students. Unfortunately their age range is rather strict, however if you are looking for a tour better suited to your age range, we would be happy to assist you in finding some alternatives! Is it a problem if I miss the Welcome Meeting? If your arriving late and cannot attend the welcome meeting then this isn't a problem, just be sure to let your guide know. They will make you aware of the arrangements for the following day. TourRadar only requires a deposit of $99 to confirm this Intrepid Travel booking. The remaining balance is then payable 60 days prior to the departure date. For any tour departing before 17 June 2019 the full payment of $331 is necessary. No additional cancellation fees! 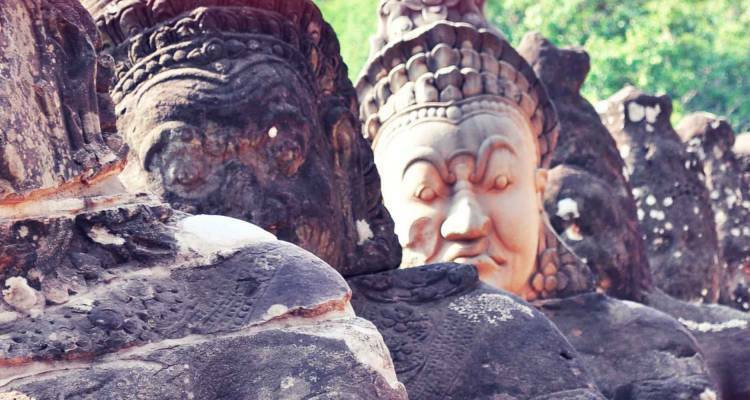 You can cancel the tour up to 60 days prior to the departure date and you will not need to pay the full amount of $331 for Six Days in Cambodia, but the deposit of $99 is non-refundable. Covering a total distance of approx 290 km.